It was nine years ago that a bearded man strolled into my office asking to know more about SVYM and our activities. He seemed to be a man in a hurry and was keen on knowing what we did, what we stood for and how he could participate in our activities. This kind of experience not being new to me, I tried to patiently explain and answer all his questions. Deep down, experience had also taught me that such casual visitors usually promise a lot but hardly do anything about them later. But I was in for a pleasant surprise, for this person not only promised nothing except his involvement in our work but has ended up doing so much for the organization and the causes that we represent. He is Ramesh Kikkeri, an engineer by qualification and training, a farmer by profession, an environmentalist by the life he leads, a good samaritan by temperament and more importantly, one of my very good friends. What started off as a chance meeting talking about his involvement is today something that needs to be seen to be believed. The living proof of his convictions, efforts and knowledge can be seen in our organic farms both at Saragur and Hosahalli. Within a month of his first visiting us, I challenged him by showing our empty field behind our Saragur school and asked him if he could green them within the next few years. He cheerfully and enthusiastically took on the gauntlet and what one sees today is something of a wonder. Talking to him will not reveal the multifaceted and multi-skilled nature of his personality. Proof of his knowledge and engineering skills are evident from the ‘Sadhana’ building that has come up at our Mysore campus. Apart from this, he has coordinated many of the smaller constructions at Saragur and Hosahalli. While his focus is on reducing costs while ensuring optimal quality, he also constantly tries to integrate innovative construction methodologies and materials into our buildings. Sadhana is also designed to be energy-efficient and has today become a ‘study site’ for many builders, civil engineers, architects and engineering students. Another aspect of his personality is his love for teaching and studying. He seems to be eternally studying. A few years ago, he finished his MBA in Environmental Management and today is doing another MBA. 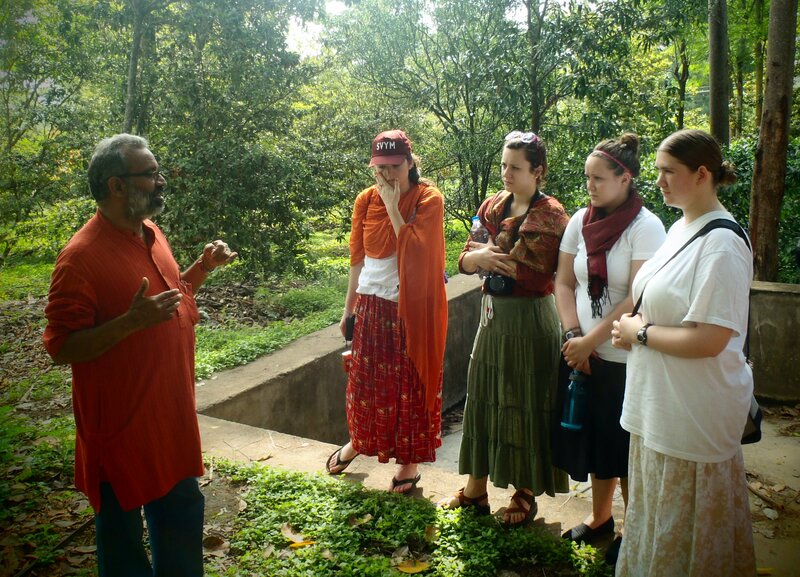 At Mysore, he can be seen passionately talking to the MDM students at VLEAD or to the foreign students at VIIS, where he is a faculty at both. He has also been appointed as an Associate Professor of International Programs at the University of Iowa, USA and he co-ordinates the ‘Health and Environment’ part of the program along with Dr Sridevi. Ramesh also lives what he teaches and speaks about. His passion for environmental concerns is legendary, but can be a pain to people around him. I remember once when he came to a wedding ceremony with me and suddenly walked out of the lunch that was about to be served. His explanation was very simple – he just could not afford to partake food in a gathering that so generously used ‘plastic’. Though his family felt a little embarrassed, my admiration and respect for him went up. How many of us will stick on to our ‘convictions’ despite the ‘peer pressure’ from family and friends around. Ramesh is indeed lucky to have an understanding wife in Sudha and two wonderful children. He is now working in making our campuses ‘models’ in energy conservation, water management, bringing in newer WATSAN techniques at waste management and eliminating the use of pesticides and inorganic chemicals. I could feel and share his pain and anguish when he found inorganic chemicals being used in our community agriculture programs recently and in another instance when bee-hives were removed chemically. He is involved in agriculture in tens of acres of land in and around Mysore. He owns not a single acre, but all that he wants is to promote organic farming and make a difference in the world we live in. His candidness may sound irritating to a few, but is one of the many facets of his character that I like a lot. Having candid and frank counsel from people like him is what makes our projects and organizations work so well and meet the expectations that we have set for ourselves. I can keep writing a lot more about him. But suffice it to say that he is a very special person with wonderful gifts that has been endowed on him. He does not see himself that way at all. For him, his skills are for the society to use; nothing more, nothing less. His cost concerns and thought of sustainability in all that he does, his philosophy of not owning but constantly doing (living the Gita), his helping nature, quietly leading by example – all this demonstrates his simple but highly evolved life. He is not only a great friend to have but also a true Karma Yogi within SVYM.